Specify quantity and dimensions of sheets, pieces or panels. Indicate gauge and kind of material. If in doubt, specify thickness in decimals. 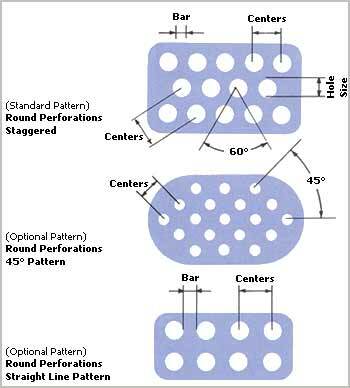 Size, shape, arrangement and center of holes. If slotted holes are selected, specify whether they are to run lengthwise or crosswise of the sheets. Specify widths of all margins. If mounting holes are to be used, give size of holes and locations on margin. Special shipping instructions, if any. Unless otherwise informed, we normally ship by motor freight. If material is to be shipped by rail, please give specific shipping instructions. When custom panels, screens or other non-standard items are required, send exact specifications. For clarification, submit sketch or print. SWD- “Short way of diamond, or design” dimension; first number is style designation. LWD- “Long way of diamond, or design” dimension; not used in style designation. SWO- “Short way of opening” dimension; used to indicate clear opening in the short direction. Strand Thickness- Equal to the thickness of the sheet of metal used. The gauge number or decimal thickness is usually the second number in the style designation. 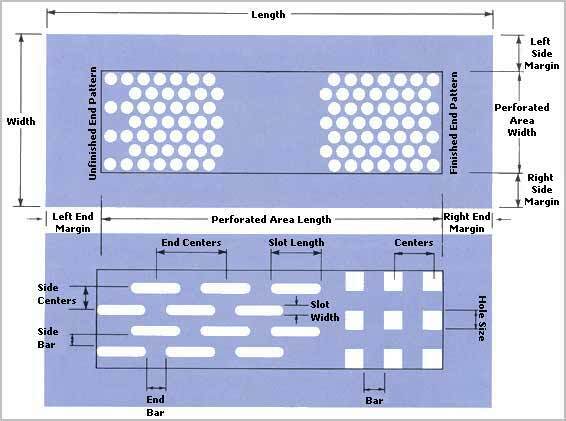 Strand Width- Amount of metal fed under the dies to produce one strand. Bond Sheared: Where two strands intersect. Eliminates prongs or jagged edges. Tolerance: Minus 0 plus 1/2 the design size, either SWD or LWD. Special bond tolerances on meshes of 1/4” and under. Random Sheared: This type of shearing leaves prongs or jagged edges. Tolerance: ±1/16”. On grating ±1/8”. Standard Sheet Sizes: 48” SWD x 96” LWD. Specify the number of sheets or pieces required.